Riverland Wine chair Chris Byrne told Grapegrower & Winemaker he was pleased there had been further improvement in prices this year, although some wineries had been “very disappointing” as they’d taken a long time to finalise their prices, making it difficult for growers to plan around them. He said the Riverland’s 900+ growers managed heatwaves in December and January very well and were generally pleased that they’d seen another year of generally good prices, with Chardonnay moving up significantly. Several wineries had brought grapes in, while others had shown flexibility in the times they were receiving grapes. Byrne said major red varieties such as Shiraz, Cabernet Sauvignon and Merlot were sitting at roughly $600/tonne. In 2018 some Chardonnay prices were at over $400. Byrne said the average price was now estimated to be $350, but said Riverland Wine was confident Chardonnay prices would move up another $10 or $20. Table 1. 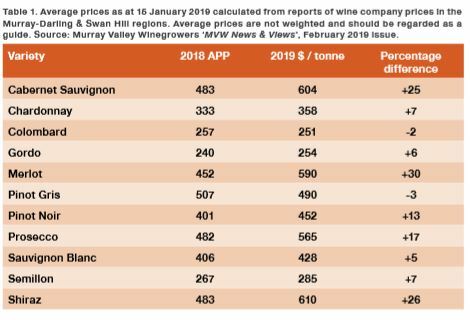 Average prices as at 15 January 2019 calculated from reports of wine company prices in the Murray-Darling & Swan Hill regions. Average prices are not weighted and should be regarded as a guide. 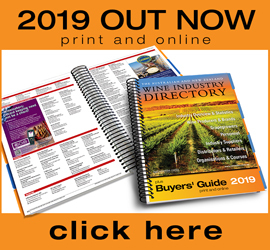 Source: Murray Valley Winegrowers ‘MVW News & Views’, February 2019 issue. From the Murray Valley Winegrowers’ News & Views newsletter, the major reds are the strongest performers; the reds are ahead of Chardonnay by almost 70 percent. 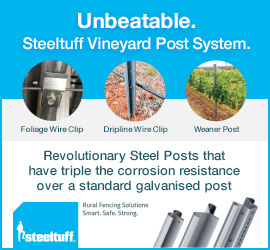 “Since the horror vintage of 2015 when Cabernet, Merlot and Shiraz failed to average more than $300/tonne, these varieties are now attracting offers of $600/tonne and more,” wrote Murray Valley Winegrowers’ Incorporated executive office Mike Stone. “On the other hand, the main white varieties are achieving relatively minor increases, although it should be remembered that in 2015 Chardonnay, for example, averaged just $180/tonne whereas in 2018 the average price for Chardonnay in the MurrayDarling and Swan Hill regions was $333/ tonne. This year it’s likely to be in the order of $360 tonne,” Stone said. Table 2. Grape prices from three wineries sourcing fruit in the Riverina. 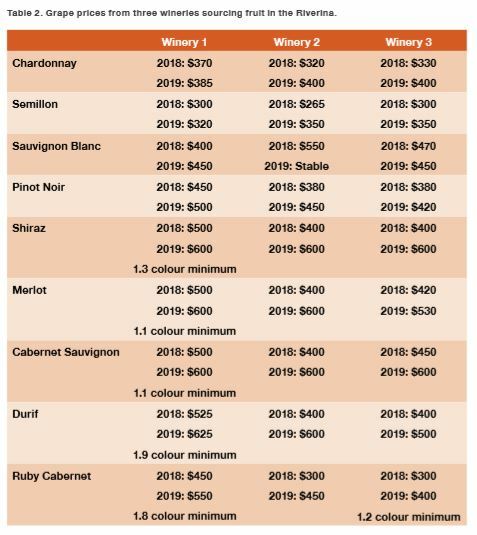 Brian Simpson, chief executive of the Wine Grape Marketing Board (WGM), provided Grapegrower & Winemaker the prices from three wineries that the organisation had at the time of writing (Table 2). Despite Section 18GA of the National Measurement Act 1960 Simpson said a number of wineries continued to use colour scoring as a means of pricing red varietals. This section requires that the instruments used must be verified by a regulatory authority. He said growers with good canopy and access to sufficient water had reported good crops with above-average yields. Younger vines and those without sufficient water had been impacted by the heatwave conditions at the start of the vintage. Baume levels were holding well with wineries reportedly relaxing some of their intake standard to ensure they receive fruit in good sound condition, Simpson said. Langhorne Creek Grape and Wine Incorporated (LCGWI) told Grapegrower & Winemaker that, anecdotally, growers were very happy that prices were improving in the region. 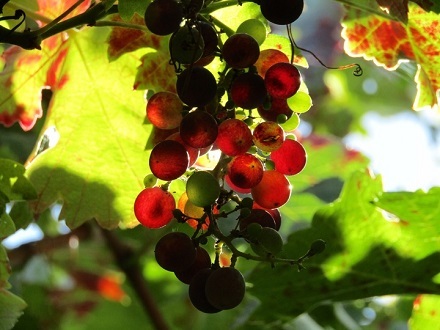 “There is certainly an increased demand for Langhorne Creek fruit in 2019, especially given that some regions suffered from fruit setting issues earlier in the growing season and the impact of the extreme heat,” LCGWI reported. As Margaret River temperatures since August last year have been slightly cooler than recent averages, the 2019 vintage start date was forecast to be two to three weeks later than normal for most wineries in the region, and more similar to vintage 2017, Amanda Whiteland, chief executive of Margaret River Wine Association, told Grapegrower & Winemaker. Yields were also looking lower than last year, Whiteland said, but with diligent vineyard management practices, Margaret River’s consistent quality was expected. She said the average market price for Chardonnay had increased and Cabernet Sauvignon was holding strong, increasing particularly at the icon level. Prices for Shiraz and Merlot were similar to last year while the average prices for Sauvignon Blanc and Semillon looked to be down due to very competitive pricing for these varieties, consolidation of the nation’s retailers and reduced wine range offerings. 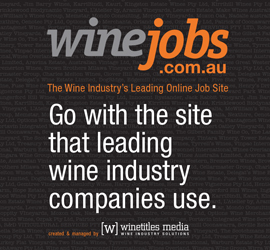 Following consultation with local viticulturists, Chris Tyrrell, board member of the Hunter Valley Wine and Tourism Association, told Grapegrower & Winemaker that prices were generally holding across the board. “Some edged up but eased back after a few larger buyers reduced their external fruit buying this year. Solid white tonnages also saw potential for increases not occur,” Tyrrell said. “There is no formal price collection locally so it’s all a bit speculative. Also, [there have been combinations of] machine harvest, handpicked, and on-the-vine pricing,” he said. This article was originally published in the March edition of Grapegrower & Winemaker magazine. Click here to subscribe.